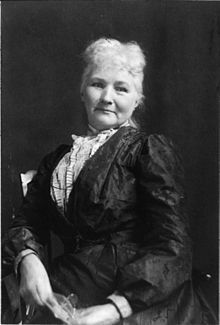 Mary Harris "Mother" Jones (August 1, 1837 – November 30, 1930), born in Cork, Ireland, was a prominent American socialist, labor and community organizer, and a founder of the Industrial Workers of the World. After being introduced as a "great humanitarian", as quoted in Mother Jones : The Most Dangerous Woman in America‎ (2002) by Elliott J. Gorn, p. 3. No matter what your fight, don't be ladylike! God almighty made women and the Rockefeller gang of thieves made the ladies. [Regarding the military violence and terrorism against the miners of the 1903 Cripple Creek strike] And why were these things done? Because a group of men had demanded an eight hour day, a check weighman and the abolition of the scrip system that kept them in serfdom to the mighty coal barons. That was all. Just that miners had refused to labor under these conditions. Just because miners wanted a better chance for their children, more of the sunlight, more freedom. And for this they suffered one whole year and for this they died. When I get to the otherside, I shall tell God Almighty about West Virginia! I could have settled it in twenty-four hours… I would make the operators listen to the grievances of their workers. I would take the $650,000 spent for the militia during this strike and spend it on schools and playgrounds and libraries that West Virginia might have a more highly developed citizenry, physically and intellectually. You would then have fewer little children in the mines and factories; fewer later in jails and penitentiaries; fewer men and women submitting to conditions that are brutalizing and un-American. I refer to the United States, the union of all the states. I ask then, if in union there is strength for our nation, would there not be for labor! What one state could not get alone, what one miner against a powerful corporation could not achieve, can be achieved by the union. What is a good enough principle for an American citizen ought to be good enough for the working man to follow. Organized labor should organize its women along industrial lines. Politics is only the servant of industry. The plutocrats have organized their women. They keep them busy with suffrage and prohibition and charity. I do not believe that iron bars and brutal treatment have ever been cures for crime. And certainly I feel that in our great enlightened country, there is no reason for going back to middle ages and their form of torture for the criminal. Human flesh, warm and soft and capable of being wounded, went naked up against steel; steel that is cold as old stars, and harder than death and incapable of pain. Bayonets and guns and steel rails and battleships, bombs and bullets are made of steel. And only babies are made of flesh. More babies grow up and work in steel, to hurl themselves against the bayonets, to know the tempered resistance of steel. Christ himself would agitate against them. He would agitate against the plutocrats and hypocrites who tell workers to go down on their knees and get right with God. Christ, the carpenter’s son, would tell them to stand up on their feet and fight for righteousness and justice on earth. In spite of oppressors, in spite of false leaders, in spite of labor’s own lack of understanding of its needs, the cause of the worker continues onward. Slowly his hours are shortened, giving him leisure to read and to think. Slowly, his standard of living rises to include some of the good and beautiful things of the world. Slowly the cause of his children becomes the cause of all. His boy is taken from the breaker, his girl from the mill. Slowly those who create wealth of the world are permitted to share it. The future is in labor’s strong, rough hands.